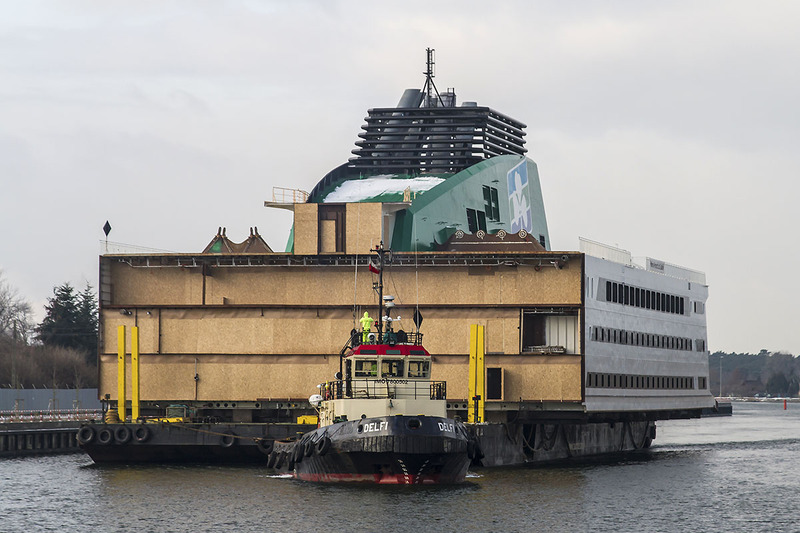 As of early February – the heavy-lift operation of installation of the three blocks to form a superstructure of a new large ferry was underway at Flensburger Schiffbau-Gesellschaft (FSG). Gdańsk based Marine Projects Ltd. Sp. z o.o. has delivered these partially, but to high extend outfitted, superstructure blocks for Flensburg based yard. Two blocks of superstructure departed from Gdansk, towed on barge-pontoons, in the middle of the first week of January. 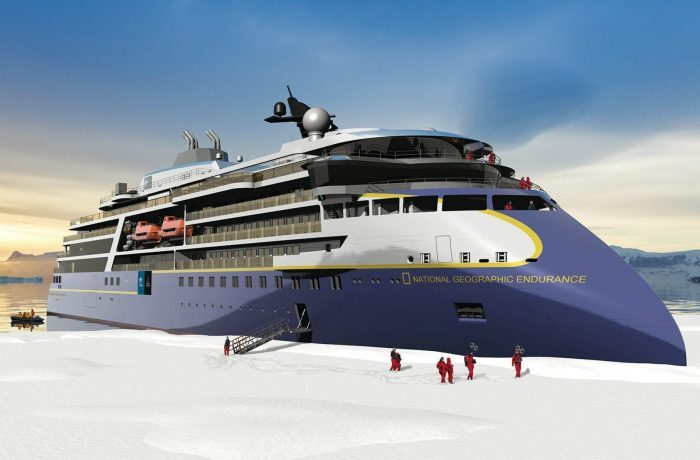 The third, largest one, with engine casing and chimney, was towed out on January 19. The two first ones arrived in Flensburg on the 20th day of the month, the last one – on Monday, January 22. A block of a superstructure from the forebody part of the ship, containing, inter alia, the wheelhouse, and the stern module, with funnel, were built at the Marine Projects shipyard in Przeróbka district, by the river Martwa Wisła. The central block, to the order of Marine Projects, was built at Holm Construction Ltd. Sp. z o.o. on Ostrów Island and from there it was towed to Germany. 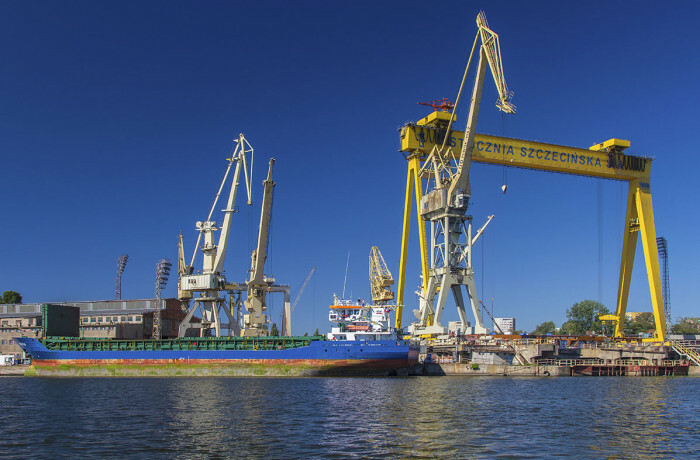 Flat sections for the construction of the superstructure had been prefabricated at Stocznia Gdańsk (Gdansk Shipyard). The three parts of the superstructure for FSG weighed a total of approximately 5,500 tons. 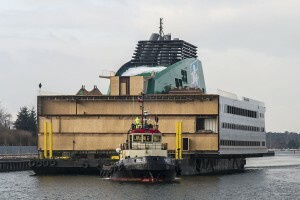 Tow out of the last part of the superstructure for Irish Ferries vessel under construction at FSG. The degree of technical readiness of a completely painted superstructure is estimated at approx. 70%. For example, two of the three decks of the superstructure were almost completely outfitted in Gdańsk (except for furniture). All floors, ceilings, formwork and wall panels have been installed in the passengers’ spaces and crew quarters. In the wheelhouse, among others, all consoles, in which navigation, communication, monitoring and control devices will be embedded, have been installed in Gdansk. They have been also partially connected to the cabling system. The air-conditioning and ventilation system, with the HVAC room and ventilation ducts, have been completed in Gdańsk in approx. 80 %. Practically 100 % completed in Gdansk has been the outfitting of the engine casing with funnel stack. The superstructure just delivered by Marine Projects is destined for the W.B. Yeats (shipbuilding No. 771) the hull of which is almost completely finished and was launched on 19 January. It is a ship with a capacity of about 10,000 tons and a gross tonnage of 50,400, on order from Irish Continental Group Plc (it will be operated in Irish Ferries livery). 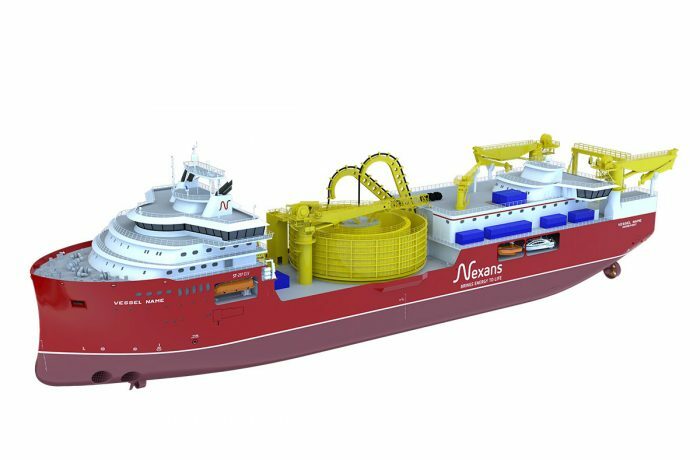 The Marine Projects shipyard will be fabricating further large superstructures for the shipyard from Flensburg, however, work on the first of these will begin only this autumn. 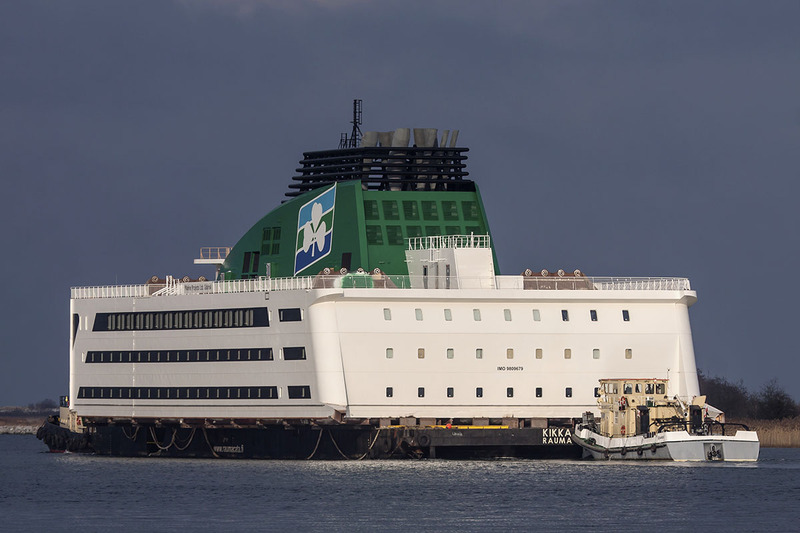 It will be partly outfitted superstructures for a large ferry for Brittany Ferries – Honfleur (shipbuilding number 774) and another unit, not yet named, for Irish Ferries again (yard no. 777). 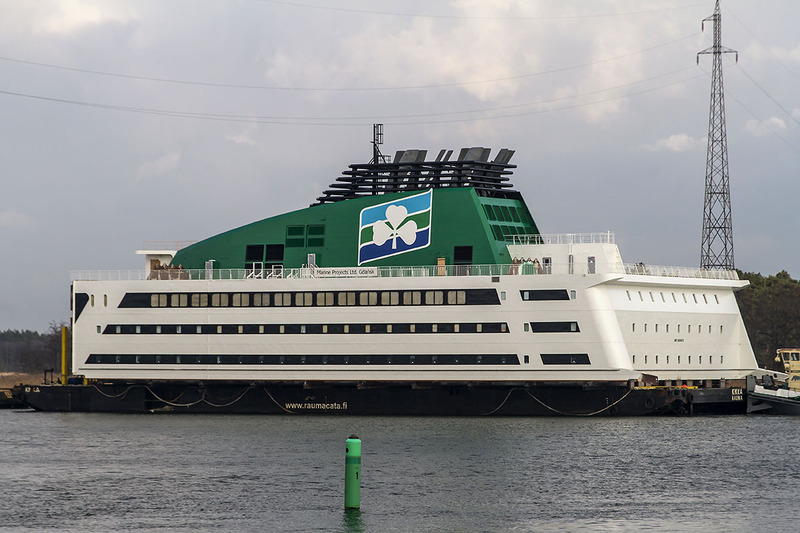 In addition to superstructures for large ferries for FSG, Marine Projects have orders from the same German shipyard, among others, for two superstructures on cargo ro-ro vessels, and two partially equipped fishing vessels from the Norwegian shipyard.